Wednesday, May 8. Kansas City, Mo. Dale Wilch's Man Cave Indoor Swap Meet. 1501 West 31st Street, 64108. 6:00 p.m.-9:00 p.m. For more information, call Dale at (913) 788-3219, e-mail dale@rpmcat.com, or visit http://www.dalewilch.com/. Wednesday, May 8. Independence, Mo. 40 Hwy Big Boy Cruise Night. 12401 E 40 Hwy (40 Hwy and Crysler Avenue), 64055. For more information, call Mike at (816) 519-6424. Wednesday, May 8. Overland Park, Kan. Sonic Cruise Night. 9801 Quivra. 5:00 p.m.-9:00 p.m. For more information, call Jason at (913) 307-0062. Thursday, May 9. Belton, Mo. Adesa Corvette and Specialty Car Sale. Adesa Kansas City, 15511 Adesa Drive, 64012. For more information, call (816) 525-1100, or visit http://www.adesa.com/Kansascity. Friday, May 10. Basehor, Kan. Basehor Boys Cruise Night. Sonic Drive-In. 155th and State Avenue (US24/40). 5:00 p.m. For more information, call Don at (913) 579-1669, or e-mail gonnacrash@sunflower.com. Friday, May 10. Overland Park, Kan. Longbranch Saloon TGIF Cruise. Longbranch Alehouse, 9095 Metcalf, 66212. 5:00 p.m.-9:00 p.m. For more information, call (913) 912-7344. Friday, May 10. Blue Springs, Mo. Blue Springs Cruise Night. Downtown Blue Springs, Main Street between 10th and 12th Streets. 6:00 p.m. For more information, call (816) 228-0238. Saturday, May 11. 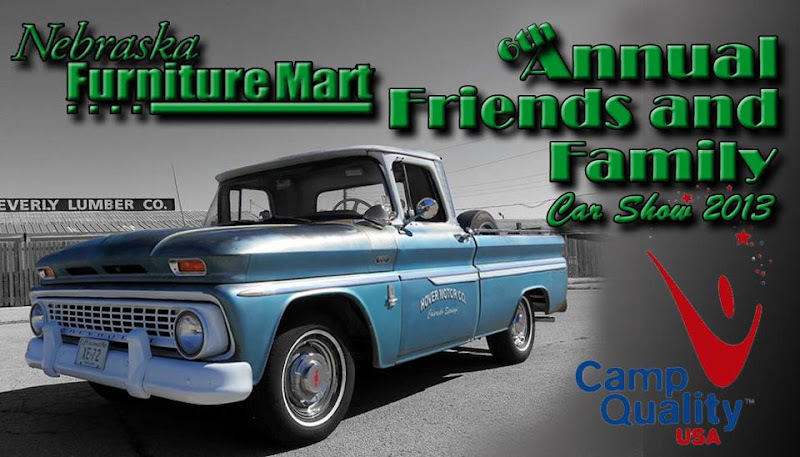 Kansas City, Kan. 6th Annual Nebraska Furniture Mart Friends and Family Car Show. 1601 Village West Pkwy, 66111. 10:00 a.m.-2:00 p.m. For more information, call Doug at (816) 728-8985, or e-mail carshow@nfm.com. Saturday, May 11. Independence, Mo. Summer Cruise-In at the Hartman Heritage Center. Jackson Drive next to Buffalo Wild Wings. 6:00 p.m. For more info contact Jim at (816) 808-1154. Saturday, May 11. North Kansas City, Mo. 2nd Saturdays NKC Car Cruise. 1900 Fayette Street. 3:00 p.m.-9:00 p.m. For more information, call Tim at (816) 472-7788, Nathan at (816) 835-0211, Carrie at (816) 453-1666, e-mail 2ndsaturdaykc@gmail.org, or visit http://www.nkcrotary.org/. Saturday, May 11. Independence, Mo. 15th Annual Legends of the Past Car Show. Noland Road Baptist Church. 4505 S Noland Road, 64055. 10:00 a.m.-1:00 p.m. For more information, call Lee at (816) 356-7019, or visit http://www.mynrbc.com/carshow.html. Saturday, May 11. Shawnee, Kan. Mustang Club of Greater KC Cruise. Bates City BBQ, 6943 Quivera, 66216. 6:00 p.m.-9:00 p.m. For more info visit http://mustangclubofgreaterkc.com/activities/cruise-nights or www.facebook.com/MustangClubOfGreaterKC . Saturday, May 11. St. Joseph, Mo. Northwest Missouri Street Rods Cruise Night. East Ridge Village, 3900 Frederick (I-29, exit 47). 5:00 p.m. For more information, call Kat at (816) 233-0312. Saturday, May 11. Topeka, Kan. HPAC Cruise Night. Fairlawn Plaza Shopping Center, 21st and Fairlawn, 66614. 6:00 p.m.-9:00 p.m. For more information, call (785) 231-0719, visit www.hpacmopar.com, or e-mail wings6970@aol.com. Saturday, May 11. Reeds Spring, Mo. 6th Annual Reeds Spring Missouri Car Show. Reeds Spring High School, 20277 Highway 413, 65737. Registration 8:00 a.m.-Noon. Awards, 3:00 p.m. For more information, call Bob at (417) 559-1534, e-mail rsbandboosters@gmail.com, or visit www.wolfpridecarshow.com. Saturday, May 11. Sugar Creek, Mo. Vintage Thunderbirds of Kansas City Car Show. O'Reilly Automotive, 11218 E US Hwy 24, 64054. 10:00 a.m.-3:00 p.m. For more information, call Gerald at (816) 796-8815. Saturday, May 11. Smithville, Mo. 5th Annual Larson’s Cruise for the Cure. Smithville High School, 645 South Commercial Avenue, 64089. Registration 8:00 a.m. For more information, call (816) 520-6138, or e-mail jmckown6@kc.rr.com. Saturday, May 11. Lenexa, Kan. Griot’s Tech Session. The Complete Garage, 15209 West 87th Street Parkway, 66219. 10:00 a.m.-2:00 p.m. Detailing tips and product sampling. For more information, e-mail nonahernandez@sbcglobal.net. Saturday, May 11. Clinton, Mo. Clinton Cruise Night. Historic Downtown Clinton Square. 5:00 p.m. For more information, call Diane at (660) 885-8166, or visit http://www.clintonmo.com/HistoricDowntown/CruiseNights/tabid/214/Default.aspx. Saturday, May 11. Kansas City, Mo. Friends of Parkville Animal Shelter Lincoln Test Drive. Harmony Vineyard Church, 1-29 and North Oak. 8:00 a.m.-4:00 p.m. For more information, visit http://parkvilleshelter.com/lincoln-test-drive-fund-raiser/. Saturday, May 11. Peculiar, Mo. Pete and Jake’s Open House. 401 Legend Lane. For more information, call Jerry at (800) 334-7240. Saturday, May 11. Kansas City, Mo. AAA North KC Auto Show. 7679 N.W. Prairie View Rd, 64151. 9:00 a.m. to 2:00 p.m. Domestic Cars Only. For more information, call (816) 455-4900. Sunday, May 12. 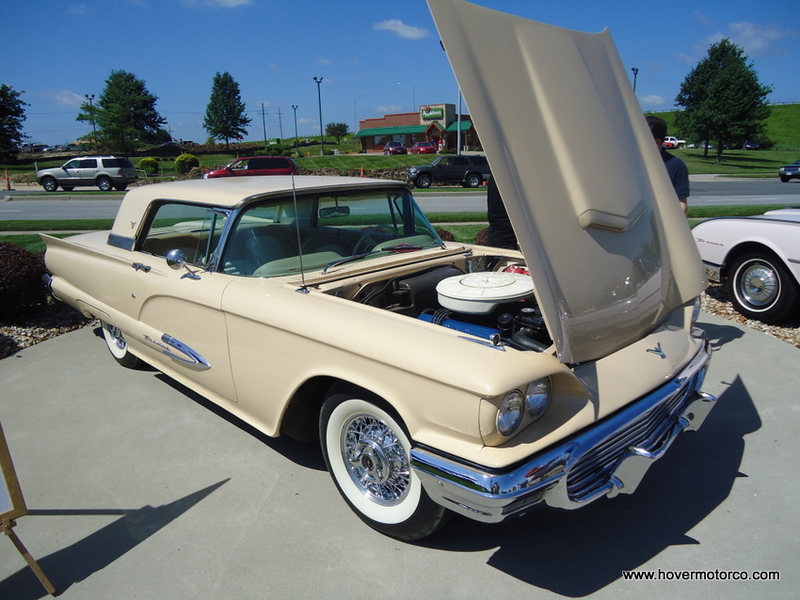 Overland Park, Kan. Sonic Drive-In Cruise Night. 12090 Metcalf (Old Metcalf) 66213. 3:00 p.m.-7:00 p.m. For more information, call Shana at (913) 451-8883. Sunday, May 12. Kansas City, Mo. Art of the Machine Show featuring the Kansas City Fiero Owner’s Club. City Market of Kansas City, 20 Genessee St., 64102. For more information, call Deb at (816) 842-1271, or visit http://thecitymarket.org/events/art-of-the-machine-car-series. Friday, May 10. Kansas City, Kan. CARB Night at the Races. Lakeside Speedway. 5615 Wolcott Drive, 66109. 7:30 p.m. For more information, call (913) 299-9206, or visit http://www.lakesidespeedway.net/. Friday, May 10. Grain Valley, Mo. Valley Sprint Special. Valley Speedway, 348 E Old 40 Hwy, 64029 . For more information, call (816) 229-2222, or visit http://valleyspeedway.com/ . Friday, May 10. Topeka, Kan. Street Legal Test and Tune. Heartland Park Topeka, 7530 SW Topeka Blvd, 66619. 6:30 p.m. For more information, call (785) 862-2016, or visit http://www.hpt.com/. Friday, May 10 and Saturday, May 11. Kansas City, Kan. Season Ticket Holder Speedway Drive. Kansas Speedway. 400 Speedway Blvd, 66111 7:00 p.m.-10:00 p.m. each evening. For more information, call (866) 460-RACE, or visit http://www.kansasspeedway.com/Vanity-Pages/2011/DRIVE.aspx. Saturday, May 11. Winston, Mo. Weekly Racing Series. I-35 Speedway. Interstate 35 and Highway 6, 64689. For more information, call (660) 749-5317, or visit http://www.i-35speedway.net/. Saturday, May 11. Wheatland, Mo. Business Expo Night at the Races. Lucas Oil Speedway, 700 E Hwy 54, 65779. For more information, call (417) 282-5984, or visit http://www.lucasoilspeedway.com/. Saturday, May 11. Grain Valley, Mo. USRA Modifieds. Valley Speedway, 348 E Old 40 Hwy, 64029 . For more information, call (816) 229-2222, or visit http://valleyspeedway.com/ . Saturday, May 11. Lebanon, Mo. Weekly Racing Series. Lebanon I-44 Speedway. 24069 Route 66, 65536. For more information, call (417) 532-2060, or visit http://i44speedway.net/. Saturday, May 11. Topeka, Kan. BriggsAuto.com Super Saturday Dirt Showdown Series. Heartland Park Topeka, 7530 SW Topeka Blvd, 66619. For more information, call (785) 862-2016, or visit http://www.hpt.com/. Any updates on this closed museum? I know that the owner finally put that Stutz back together and drove it during a pre-race event at the Indy 500 a couple of years ago. Other than that, I really haven't heard much. Hey Craig - not sure if you heard anything about the NKC show but I went by that intersection last night around 7:30 and there was nobody there. I must have gone to the wrong place? Sorry, Kyle. I couldn't even make it out. I e-mailed North Kansas City,and they told me that the North KC Rotary Club had taken over the 2nd Saturdays Cruise. So I went to their website, and it said something about it starting in May. So I included it on the calendar. I'll have to try and figure out if they're doing it all before I post something about it next month. Thanks. No worries; it was on my way home from the Mustang Club cruise anyway. Thanks! Is there a schedule for June and July somewhere? I don't go out that far. I try and post a schedule for the upcoming weekend every Tuesday afternoon.